Everyone knows that physical activity is good for the body. The physical benefits of regular exercise are well known and sought after by all. What most people probably don’t think of when they are physically active is the impact it is having on their mind and overall mental health. While exercise is of course a key component in things like achieving a healthy weight, improving physique and reducing risk of disease, it is the vast influence on health and well-being that motivates people to stay active. A recent study conducted by The Lancet found that exercising for 45 minutes three to five times a week was associated with the biggest benefits to mental health, so you don’t have to be a complete fitness fanatic to reap the rewards. Research also indicates that exercise doesn’t have to be strenuous or take a long time, with activities such as team sports, cycling, walking, jogging and going to the gym all having a positive impact. One of the most common mental benefits of exercise is stress relief. Exercise increases levels of norepinephrine, a chemical that can moderate the brains response to stress. Exercise also stimulates the release of endorphins, which are known to help produce positive feelings and can be a great distraction for people suffering from symptoms of anxiety. The endorphins released during exercise help to create feelings of happiness and euphoria. Exercising increases your serotonin level (the “feel good” neurotransmitter), which helps to decrease negative emotions and increase positive ones. Exercise and increased activity levels prevents degeneration of the hippocampus, an important part of the brain that plays a key role in memory and learning. Regularly taking part in physical activity can help you relax and sleep better. Being physically active requires you to expend energy, and helps you feel more tired and ready to rest at the end of the day. In addition, exercise triggers an increase in body temperature, and the post-exercise drop in temperature can promote falling asleep. Physical fitness can boost self-confidence and improve positive self-image. The sense of achievement you get when you see your fitness levels increase and goals reached can help you feel better about yourself and lift your mood. Regardless of weight, size, gender, or age, exercise can quickly elevate a person’s perception of their self-worth. Any exercise or physical activity that gets the heart rate up, blood flowing and endorphins released is going to raise your energy level. Moderate to intense cardiovascular exercises will also strengthen your heart and help you retain your stamina throughout the day. Exercise can increase your executive functioning by improving skills like concentration, focus and creativity. Research shows that workers who take time for exercise on a regular basis are more productive and have more energy than those who don’t. The benefits of exercise to both our physical and mental health are overwhelmingly positive, with even the most modest amounts making a difference to overall well-being. 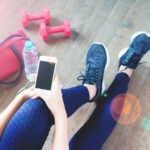 The key to remaining consistent with your fitness regime is to find a type of exercise you enjoy, stick with it, and reap the ongoing benefits of a regular workout routine! Good nutrition – why it’s important for optimum health & fitness?